Taste test: These are good. They're not too vinegary, almost like a sweet vinegar. 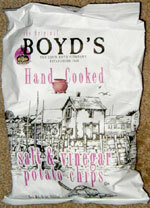 Not as oily as Cape Cod vinegar chips. It's a very strong vinegar tatse when you start eating, but by the end it faded away, and it's kind of a nice effect. Smell test: Very very vinegary.